Is acne ruining your life? Have you tried everything to get rid of blackheads and pimples? If so, you’re not alone. This common skin condition affects millions of people worldwide. If left untreated, it may lead to depression, poor self-image, and anxiety. From creams and lotions to diet, there are several ways to reduce breakouts. Benzoyl peroxide is commonly used in the treatment of acne. This ingredient may be combined with sulfur, salicylic acid, adapalene, or erythromycin for maximum effectiveness. Most benzoyl peroxide acne treatments contain 2.5 percent to 10 percent benzoyl peroxide. 1 How Does Benzoyl Peroxide Work? 2 Is Benzoyl Peroxide Face Wash Right for You? 3 Which is the Best Benzoyl Peroxide Face Wash? This compound is available under different names, depending on the brand, such as Zoderm, Triaz, Benzagel, and Benoxyl. It can be used for treating mild to moderate acne. When applied to the skin, it removes dead cells and helps reduce acne-causing bacteria. Before using this product, make sure you’re not allergic to it. Apply a small amount on your arm or face for up to three days in a row. Watch out for any signs of allergy. Benzoyl peroxide works by killing the bacteria that cause acne. It also reduces the severity of acne lesions. Compared to other similar products, it doesn’t cause antibiotic resistance. It is commonly used in combination with clindamycin or salicylic acid. Dosage depends on how severe your lesions are. Some benzoyl peroxide face wash formulas boast up to 10 percent concentration. The 2.5 percent concentration is the lowest. According to researchers, this compound is equally effective at concentrations of 2.5, 5, and 10 percent. In general, acne treatments with higher concentrations of benzoyl peroxide have more severe side effects. The FDA does not approve concentrations over 10 percent because they may cause skin burns. The 5 percent concentration is commonly used in the best benzoyl peroxide face wash formulas and has little or no side effects. Is Benzoyl Peroxide Face Wash Right for You? Benzoyl peroxide comes in different forms, such as facial creams, lotions, and cleaners. These products kill bacteria and prevent it from spreading and causing further damage to your skin. Choosing the best benzoyl peroxide face wash depends entirely on your needs. If you have mild acne, a product with 2.5 percent benzoyl peroxide will do the trick. For moderate and severe acne, use a face wash formula with at least 3.5 percent concentration. Benzoyl peroxide face wash formulas should be applied up to three times a day. Cleanse your skin with water, apply the lotion, and massage the affected area for one or two minutes. Rinse thoroughly and reapply the face wash later. It is possible to experience dryness of the skin in the first few days. For this reason, it’s recommended to start with one application daily. Use sunscreen every time you go outside to prevent irritation. If you have sensitive skin, choose an oil-free benzoyl peroxide face wash. Most users experience noticeable results within one week of treatment. The key is to maintain good skin hygiene and apply the face wash daily. Which is the Best Benzoyl Peroxide Face Wash? Humane’s 10% Benzoyl Peroxide Face Wash is our top pick in this list. At 10% benzoyl peroxide concentration, this product has strong acne bactericide properties. Many users report that it offers fast, effective action against acne and blackheads, and helped to improve their general complexion within 1-2 weeks. The cleansing component of this face wash is coconut oil based. Coconut oil is renowned as a great all-rounder in the health and skin care markets due to high concentrations of fatty acids (the good kind) and anti-oxidants. Coconut oil has been shown to be particularly good for the skin due to its hydrating properties (click here for more information on the benefits of coconut oil for blackheads and acne). Humane’s Benzoyl Peroxide Face Wash is proudly free from animal testing and harmful chemicals and is manufactured in an FDA approved facility in the US. The product comes in a generous 8oz bottle, enough for around 1-2 months of use. Along with the described quality and safety measures, we feel that this larger bottle size more than justifies their comparatively high price tag. As the old saying goes, you get what you pay for! This 10% Benzoyl Peroxide Face Wash by Topix is a great inexpensive option and contains many of the benefits of more advanced treatments. With a strong 10% concentration, this facial wash is effective at eliminating acne-causing bacteria. However, it lacks a secondary/synergistic ingredient to improve general complexion and combat the side effects of Benzoyl Peroxide (such as irritation and redness). We therefore only recommend this product for people with oily and non-sensitive skin. Topix’s Face Wash is soap free. This is beneficial as comedogenic soaps may exacerbate symptoms of acne and blackheads. A downside of this product is that it does contain strong preservative chemicals which some users report causes irritation and may bleach clothes if it comes into contain with them. The product comes in a large 8oz bottle, enough for 1-2 months for use. 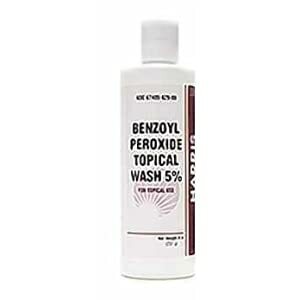 The Harris Pharma Benzoyl Peroxide Facial Wash is another great option. What differs with this product is the benzoyl peroxide concentration. At just 5%, this is a much gentler cleanser, providing an option to acne and blackhead sufferers who have more sensitive skin (though people with highly senstive skin should look for an even lower concentration). Another benefit of this cleanser is that it comes in a combo pack, providing you with extra savings when you purchase the full 16oz package. Blackheadexpert.com is a participant in the Amazon Services LLC Associates Program, an affiliate advertising program designed to provide a means for sites to earn advertising fees by advertising and linking to amazon.com. Do Pore Strips Really Work? Salicylic Acid vs. Benzoyl Peroxide: Which Is Best for Blackheads? © 2019 BLACKHEADEXPERT.COM ALL RIGHTS RESERVED. This page is for educational and informational purposes only and may not be construed as medical advice. The information is not intended to replace medical advice offered by physicians. While we endeavor to provide accurate information, we cannot be held responsible for inaccuracies. The information on this website is to be used at your own risk based on your own judgement. You assume full responsibility and liability for your own actions.